No surprise there, except that apparently the argument has caught on among some of the faithful. I am not going to bother a counter argumentation with the intelligent and well educated readers of this blog who know better. The idea is here to show you how knee jerk primitive the street slogans have become among these people. What is really scary, if you ask me, is that the billboard carrier might actually believe 100% that crap. By the way, the intense red shirts are of a recent distribution to the attendees, for free of course. You can probably find in the crowd a few people that did not wear them and have them thrown over their shoulders. Then again I might be wrong as so many ministries have now mandatory emblazoned red polo shirts. 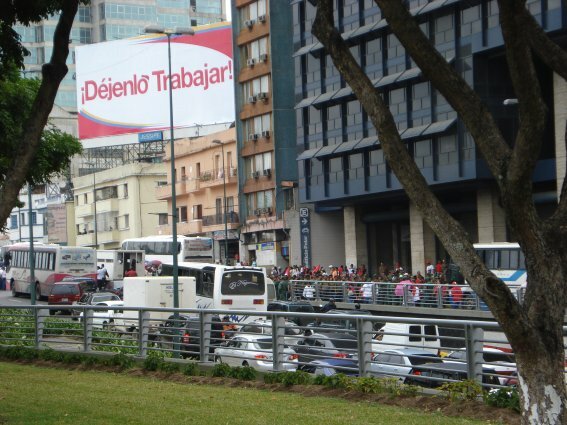 Billboards like this one seem to be the latest slogan that the "Miraflrores sala situcional" could come up with, a rewarming of what was used in 2004-2005. 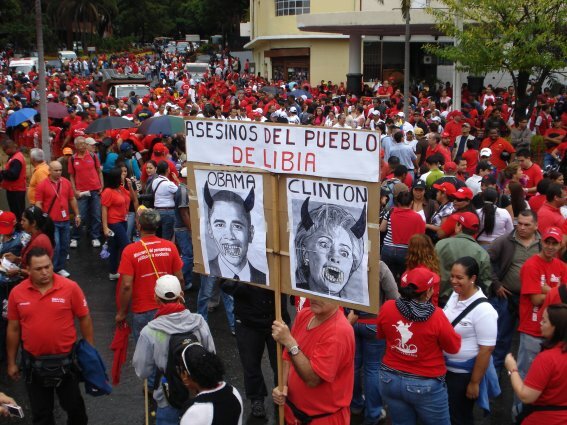 Then I still had plenty of chavistas leaving comments and I had to explain to them more than once that since 1999 for all his problems Chavez had had already significant stretches of time to rule, in particular from July 2000 until December 2001. Today offering such an excuse, that we do not let Chavez work and hence the country's problem, is simply an insult to our intelligence. I mean, since October 2004 Chavez has not had anything physically or legally stopping him to do whatever he wants!!!!! For someone that is back teaching at a Spanish campus it is simply incredible to say such an idiocy. He has an example in Spain itself, of incredible changes that happened in LESS than the 6 years he mentions, namely the 5 years of Adolfo Suarez who took Spain from Franco to democracy, including drafting a new constitution and resiting a coup. But Juan Carlos Monedero was a mercenary of Chavez and he probably would still be paid by Chavez had he not coined the term "hiperlider" meaning that Chavez was doing too much. Kind of a contraction in terms to his interview title, if you ask me.